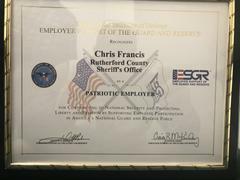 On 1-18-2019, Rutherford County Sheriff Chris Francis was recognized as a “Patriotic Employer” by E.S.G.R. 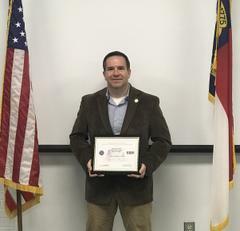 (Employer Support of the Guard and Reserve). 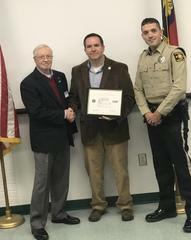 Sheriff Francis had been nominated for the award by Deputy Jospeh McComas, who is member of the National Guard and former Marine. .
Sheriff Francis received a plaque and a Statement of Support for the Guard and Reserve which was presented by Mr. Wayne Barr (N.C. 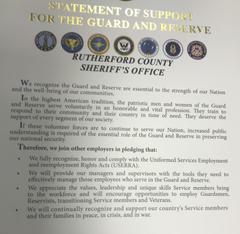 Employer Support of the Guard and Reserve Committee Member).